The Muave stinger (Pelagia noctiluca) has arrived in Ireland! 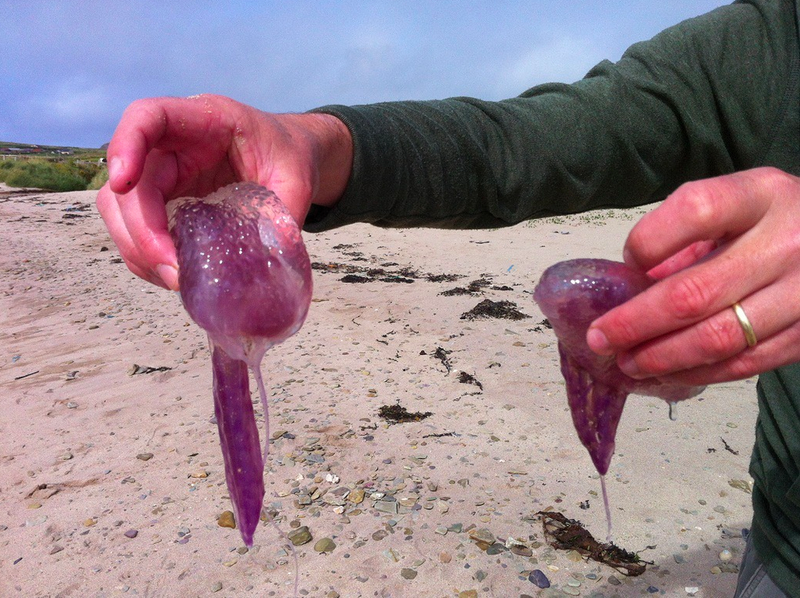 As of 2:00 PM EST the mauve stinger jelly Pelagia noctiluca is washing ashore by the thousands on Ferriters Cove, Ireland, according to the Facebook group The Big Jellyfish Hunt. In 2007, an unusually large bloom of this jelly coast nearly $2 million in lost fish farming stock in Northern Ireland. Unlike the 2007 swarm, current reports are from the southern half of the island, but the bloom still poses a major risk to beachgoers and fisheries. The mauve stinger has a powerful sting that can kill fish and bruise skin. If stung, I recommend rinsing the area with salt water, and scraping off any residual stinging cells with a credit card or other sharp edge, even if you don’t see any tentacle left behind. Rubbing a handful of sand over the area will also work. Lidocaine can be used to help ease the pain, and has also been shown to neutralize residual stinging cells in a related species . I do not recommend urine as treatment for Pelagia stings. To all those who are in the area– please observe this beautiful and rare jelly from a safe distance! A photo of Pelagia noctiluca from the Facebook group The Big Jellyfish Hunt. Do not handle Pelagia in this way. They have stinging cells on the surface of the bell and can sting long after they are dead.